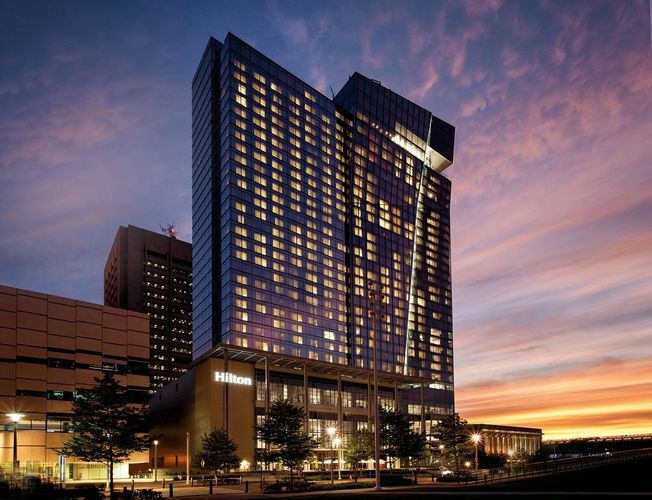 The Hilton Cleveland Downtown is a brand new premier hotel located in the heart of Downtown Cleveland. 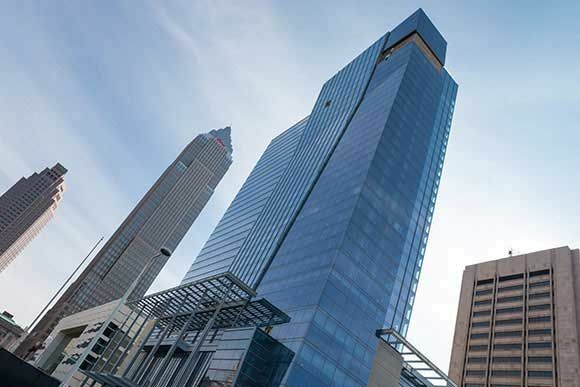 The new 642,000sf building is adjacent to both the world class Cleveland Convention Center and the Global Center for Health Innovation. 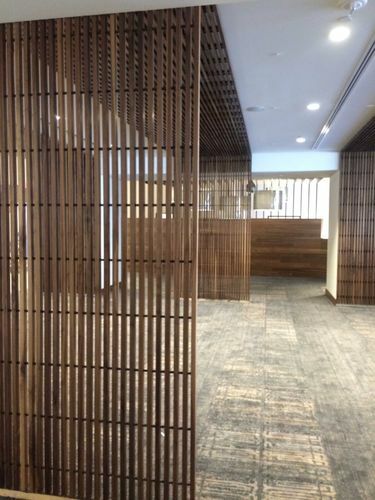 The Hilton utilizes the newest construction building technologies and design principles. The 32-story Hilton features 600 guest rooms, of which 37 are suites and 2 are grand ballrooms. The structure has a total of 55,000sf of meeting space, a rooftop bar, and even a restaurant, The Burnham. 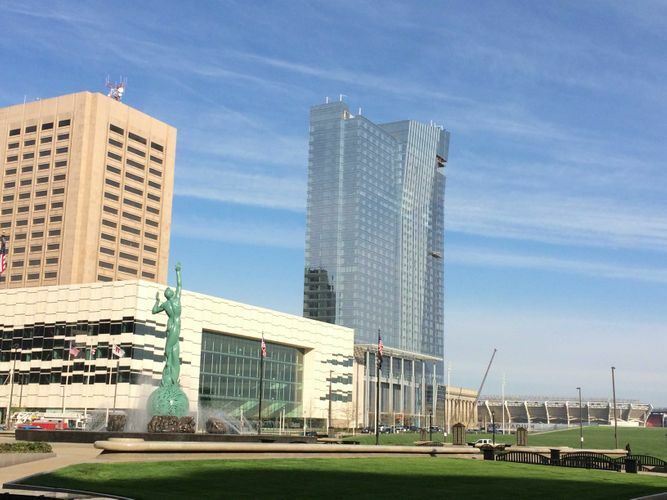 The newest of the Cleveland skyscrapers, it overlooks the historic Mall B with scenic views of Lake Erie and First Energy Stadium. 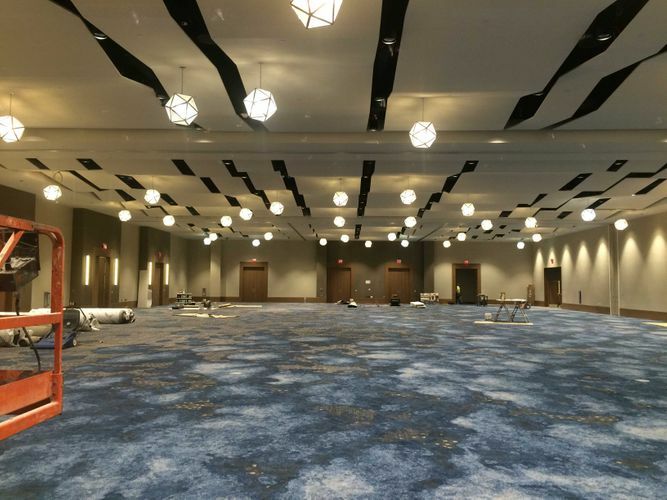 Prior to the design documents being completed, OCP Contractors was brought on by Turner, Ozanne, and VAA to perform preconstruction work related to drywall, metal studs, and acoustical and specialty ceilings. 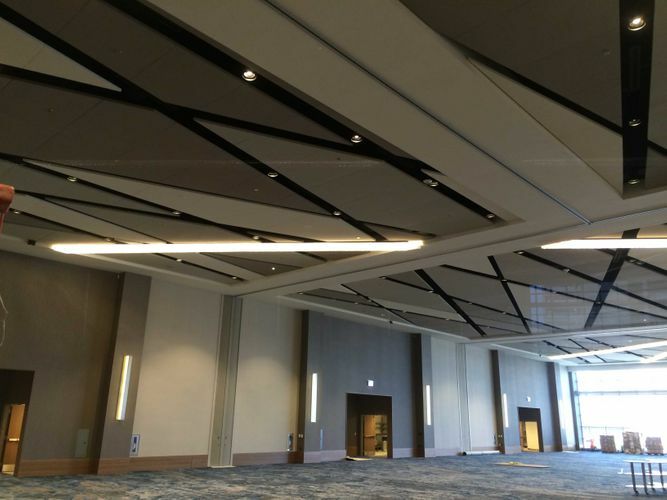 The challenge of multiple specialty ceilings necessitated extensive coordination with other trades; the triage of spray texture ceilings in all of the guest rooms, metal panel and linear wood ceilings in public spaces, and custom acoustical ceiling panels in the Grand Ballroom worked in concert to create an atmosphere of structural and architectural harmony. A demanding schedule set by the pending Republican National Convention was further hampered by both out of the ordinary winter conditions and design challenges associated with all of the custom elements included within the building. Full utilization of Building Information Modeling (BIM) technology helped prevent costly reworks and resulted in a huge time savings to the project. OCP used unique prefabrication methods and lean construction principles. Strategies included ensuring areas were completely ready before commencing work, and using “just-in-time” material deliveries to prevent re-mobilization of on-site material. OCP consistently overcame challenges by virtue of our exceptionally trained and dedicated workforce, which helped foster a cooperative and mutually beneficial relationship with the General Contractor and all other trades. Overall, the success of this project can be measured both by the customer's satisfaction and by completing a seemingly impossible schedule. The building was ready for guest check-ins as promised June 1st 2016.